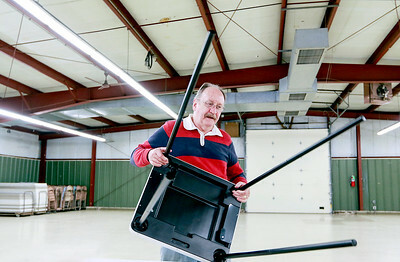 Sarah Nader- snader@shawmedia.com Al Grossmann of Crystal Lake sets up tables while helping set up a polling place at the McHenry County Fair Grounds for Tuesday's election Monday, April 6, 2015. 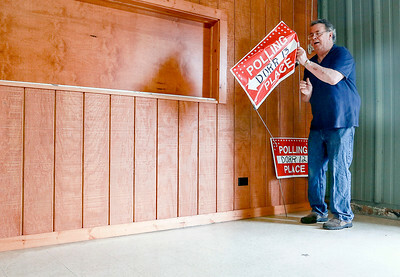 Sarah Nader- snader@shawmedia.com Steve Ahlgrim of Woodstock sets up signs while helping set up a polling place at the McHenry County Fair Grounds for Tuesday's election Monday, April 6, 2015. 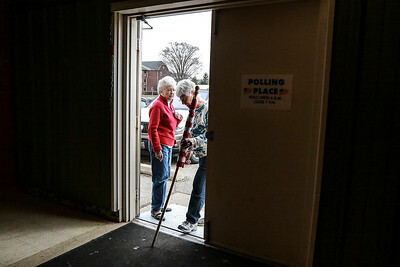 Sarah Nader- snader@shawmedia.com Election judges Joy Aavang (left) and Heather Moscinski of Crystal Lake look for a place to set up an American flag while setting up a polling place at the McHenry County Fair Grounds for Tuesday's election Monday, April 6, 2015. 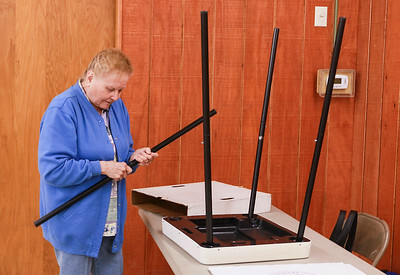 Sarah Nader- snader@shawmedia.com Rose Saunders of Woodstock sets up a table while helping set up a polling place at the McHenry County Fair Grounds for Tuesday's election Monday, April 6, 2015. Sarah Nader- snader@shawmedia.com Joy Aavang (left) of Woodstock and Rose Saunders of Woodstock go through a stack of signs while setting up a polling place at the McHenry County Fair Grounds for Tuesday's election Monday, April 6, 2015. 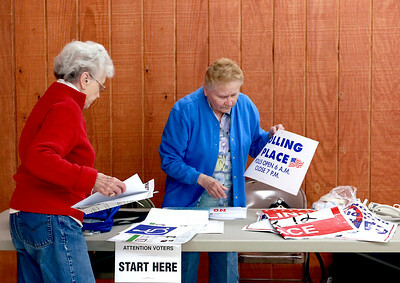 Joy Aavang (left) of Woodstock and Rose Saunders of Woodstock go through a stack of signs while setting up a polling place at the McHenry County Fair Grounds for Tuesday's election Monday, April 6, 2015.